Situated in the heart of the Perimeter, the Staybridge Suites hotel is the perfect place for both corporate and leisure travelers. Whether you are here for a night or an extended stay, we are here to ensure you feel right at home. Conveniently appointed near two MARTA public transit stations and just off I-285 and the GA-400 our prime location provides you with access to all the best of Atlanta. Explore The World of Coca-Cola, the Georgia Aquarium or simply enjoy a short walk to top-notch shopping and dining. Following your adventures in and around Atlanta, return to the hotel for a relaxing stay in our comfortable suites that are a home away from home. Take a refreshing dip in the pool or work off the day's stress in our fully equipped Fitness Room. Visit the Pantry for light snacks or join us for The Social, an evening reception, each Monday - Wednesday. We offer complimentary shuttle service, free Wi-Fi access and a 24-hour laundry facility. 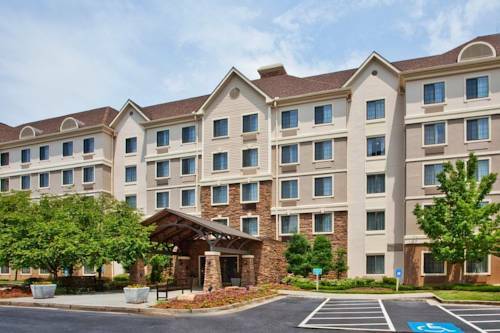 Book your next Atlanta stay today at theStaybridge Suites Atlanta Perimeter Center hotel. 800 square feet of meeting space perfect for a small business meeting. Children's program - Board games, computer games and books available in Business Center or thru the Front Desk. All your shopping and dining needs within walking distance of the hotel. Mall boasts stores like Macy's, Nordstrom and Dillard's along with The Cheesecake Factory, Season's 52, Maggiano's and Gold Fish dining eateries. MARTA takes you to several stops throughout Atlanta Downtown including the airport. 18 hole, par 61 executive golf course features brand new greens, range balls, bunkers and more. The Georgia Aquarium has the world's largest collection of aquatic animals and species from around the world. They have five unique galleries house amazing beluga whales, penguins, whale sharks and much more..
Lake Activites like boats rentals and camping. Nightlife and Restaurants....Beverly Hills of the East! Everything you want to know about Americas favorite beverage including tours! Atlanta's main event venue! Home of the Atlanta Falcons! Home of the Atlanta Hawks along with concert venues! 100-acre park with awesome rides, great shows and incredible attractions! Take a tour of the #1 News source in America - CNN!